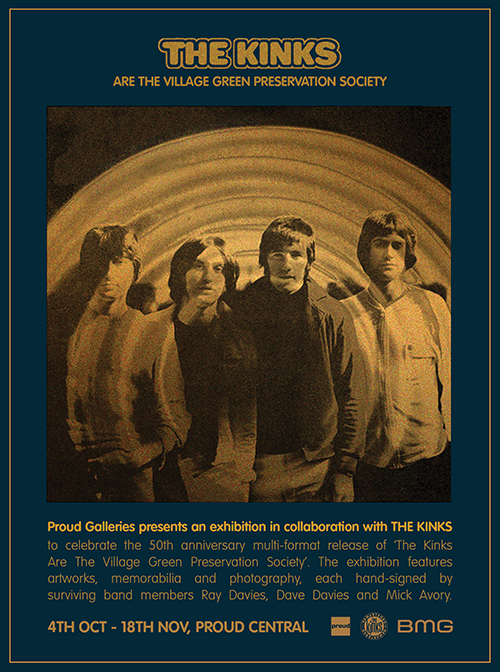 ‘The Kinks Are The Village Green Preservation Society’ celebrates the 50th anniversary multi-format release of The Kinks sixth studio album, The Kinks Are The Village Green Preservation Society. On display is a selection of rare collector’s items including specially commissioned artworks by members of the band and vintage memorabilia, together with a collection of photographs documenting this remarkable period in the band’s history. Each work is hand-signed by surviving band members Ray Davies, Dave Davies and Mick Avory. The exhibition is open to the public from the 4th October – 18th November 2018 at Proud Central.